Since last week, Kilauea, the most active volcano on Hawaii’s Big Island, has been erupting, rendering parts of the surrounding neighbourhood unrecognizable. Not only has lava destroyed 35 structures, including 26 homes, and covered the equivalent of more than 75 football fields, but a series of significant earthquakes has also been measured in recent days. And while scientists have been tracking the event since first noticing a level of unusual activity back in March, they have admitted that it’s impossible to say how long the devastation will continue. Kilauea has been erupting for more than 30 years. Last Thursday, lava began to spurt from a crack in a street, and by the following day seven new fissures had opened with some plumes shooting three hundred feet into the air. 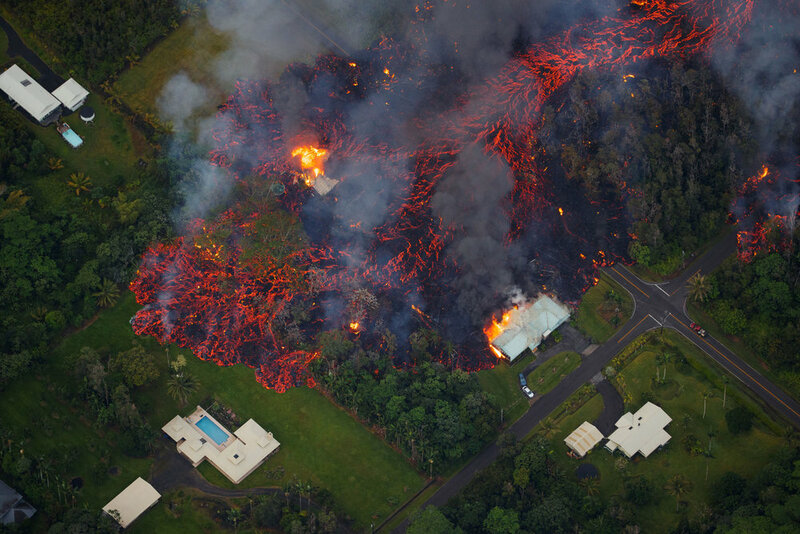 This led to authorities evacuating seventeen hundred residents from Leilani Estates and Lanipuna Gardens, who were not only at risk from the lava flow, but from poisonous sulphur dioxide gas. The fact that the area is expected to sprout new fissures for weeks if not months, creates a level of uncertainty that makes it extremely difficult for local residents, many of whom may never be able to return home and could end up homeless if they can’t afford to relocate. "When a house today might look like it's perfectly safe, it might get taken out by a lava flow five years from now if the eruption keeps on going," Erik Klemetti, a volcanologist from Denison University, is quoted as saying. So with the disaster continuing to unfold, here are three ways that you can help the victims, courtesy of CNN’s Christopher Dawson. The Salvation Army is providing hydration and meals for residents of a shelter at the Pahoa Community Center, and is setting up a distribution center in Puna. You can donate directly to their volcano disaster relief efforts on Hawaii Island here or by calling 1-808-756-0306. The Salvation Army pledges that 100% of these donations will support disaster operations. The Food Basket, a food bank on the Hawaiian Islands, has launched the Lava Flow Evacuees Aid Fund and is providing food, water and supplies to residents affected by the volcano. You can donate here. St. Louis Cardinals' baseball player Kolten Wong has started this GoFundMe campaign. Wong, a Hilo native who lived only 20 minutes from the disaster area, has pledged that every dollar donated will go toward helping the Big Island rebuild. Donate here.